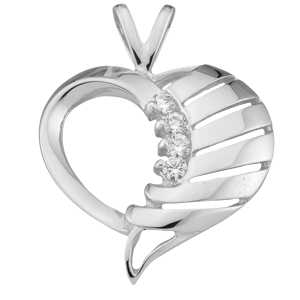 This Mothers Pendant Style 176 with 4 Stones is available in 10 kt White Gold, 14kt White Gold, 10 kt Yellow Gold, 14kt Yellow Gold, or Sterling Silver. You can customize this pendant with four birth month gemstones. This Mothers 4 Stone Pendant Style 176 with 4 birthstone settings is available in 10 kt White Gold, 14kt White Gold, 10 kt Yellow Gold, 14kt Yellow Gold, or Sterling Silver. You can customize this pendant with birth month gemstones. Classic Fine Mother's Birthstone Necklace Pendants. 4 BIRTHSTONE GEMSTONES SET IN A BEAUTIFUL HEART NECKLACE PENDANT FOR MOTHER AND FAMILIES A Four Stone Birthstone Mother's Heart Pendant is a Heartfelt Gift For Your Special Mother and all the Mothers You Love. Give your mother sparking birthstone jewelry, this sleek heart pendant will sparkle on a necklace with your four chosen gleaming birthstones. It is the perfect gift for the mother, grandmother, aunt or friend. You will surely find that unique birthstone pendant right here at Kranich's Jewelers. We have the exclusive styles and designs that will express your excellent taste in fine jewelry necklace pendants. Mother's 4 stone, birth month pendant, birthstone necklace with four stones set in this ribbon heart will be cherished. Pick the four birthstones you want to display, choose precious or semi-precious, birth month gemstones and they will be set in this lovely heart pendant. Explore our selection of pendant styles and choose your favorite precious metal for the mothers pendant you are designing. Browse our mother's pendants for styles you are attracted to and build that perfect four birthstone pendant necklace for your mother. Enjoy the pretty 4 stone birthstone pendants featured within Kranich's pendant collections and create a gift for all the mothers you know. They will feel the love every time they where this custom designed birthstone heart pendant * Beautiful Fine Jewelry Mother's Pendants * Large Selection of Pendant Styles * Four Stone Setting Pendant * Stones for the Birth Month Birthstone Pendants * 4 Stone Color Stone Pendants * 4 Stone Precious Gemstone Pendants * Semi-Custom Designed Pendants * 4 Birthstone Mother's Pendants You Design * Design Your Unique Mother's Birthstone Pendant * Crystal Birthstone Mother's Pendants SELECT AND DESIGN THE NECKLACE PENDANT OF YOUR CHOICE. Enjoy Kranich's great variety of popular 4 birth stone Pendants. Filter your selections with the design tool. Choose one of the pretty necklace pendants featured within Kranich's necklace pendant collections and enjoy the special style and originality. Select the design and then customize the pendant. DESIGN A FOUR STONE MOTHER'S PENDANT AND A BIRTHSTONE NECKLACE FOR EVERY MEMBER OF YOUR FAMILY. OUR EASY-TO-USE-DESIGN TOOL lets you build and order your custom gem stone pendant online right from this website. 1. SELECT THE Pendant setting or Pendant design style that best suits your stones and preferences. 2. CLICK ON THE GEM NUMBERED WINDOW and select the birthstones of your choice, it will appear in place on the Pendant. 3. CHOOSE YOUR PREFERRED METAL TYPE: 14kt, 10kt, yellow, white gold or sterling silver. 4. ADJUST YOUR Pendant stones and metals until your custom piece is the way you like it. 5. Choose yes or no IF YOU WANT A CHAIN for a custom Pendant. 6. ADD TO CART and CHECK OUT! CREATE A UNIQUE PENDANT FOR MOTHER AND GIVE FOR THE PERSONALIZED GIFT FOR SPECIAL PEOPLE IN YOUR LIFE. KRANICH'S JEWELERS OFFER EASY FINANCING FOR YOUR BEAUTIFUL PURCHASE.